Lump sum distribution is a financial term that usually refers to an election to receive a 401(k) plan or pension benefit as a one-time payment for the entire balance. 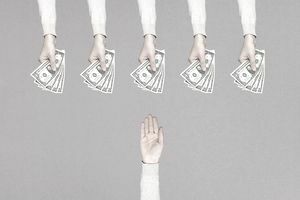 Taking a lump sum distribution is not often the best choice of distribution for an individual but there are circumstances where it can be a good option. When making a decision to transfer a qualified retirement plan, taking a lump sum distribution is usually one of at least three choices, including a rollover, partial distribution or keeping the benefit in the current account indefinitely or as long as the plan or account custodian allows. A lump-sum distribution is the distribution or payment, within a single tax year, of a plan participant's entire balance from all of the employer's qualified pension, profit-sharing, or stock bonus plans. All of the participant's accounts under the employer's qualified pension, profit-sharing, or stock bonus plans must be distributed in order to be a lump-sum distribution. In simple terms, a lump sum distribution can be described as "cashing out" of a 401(k) plan. Individuals are then faced with the decision of what to do with that distribution—either take it in the form of cash (check payable to you, the individual) or take it in the form of a rollover (check written to your new IRA custodian on your behalf). The best way to frame this decision is to begin with what not to do with your hard-earned and well-saved retirement plan money. If you can possibly avoid it, you don't want to receive your distribution in the form of cash (check payable to you). Of course, the decision of what to do with your money is yours but when you receive a lump sum in cash, it means that you have lost the favorable tax treatment of the retirement savings. In different words, the distribution becomes taxable. This is because your 401(k) contributions, in most cases, were deducted from your paychecks on a pre-tax basis—they've never been taxed. For example, if your 401(k) balance is $10,000 (assuming you have earned 100% vesting or ownership of your benefit), and you decide to "cash it out" and take a check payable to you, the amount you receive will be significantly less than $10,000 after taxes. In most cases, 20% of the cash distribution will be withheld for federal taxes, which leaves you with an $8,000 check. Depending upon your tax bracket, you could owe more in taxes beyond that! For example, if you are in the 25% federal tax bracket, your total federal taxes would be $2,500 (25% of $10,000). You'll receive the $8,000 check but you'll still owe Uncle Sam $500. The best thing you can do with your 401(k) is to choose the IRA rollover option. This may still technically be a lump sum distribution but, instead of receiving a check payable to you, you will receive a check payable to your IRA custodian. For example, if you open an IRA with Vanguard Investments. When you have terminated employment with your employer, and you receive your 401(k) distribution options, you will select the option that says something like, "Rollover to IRA" and the check will be written to Vanguard Investments (not to you). If done correctly the check will also say FBO [your name}. FBO means "for benefit of." When the rollover check is made payable to the custodian (Vanguard in this example), you do not constructively receive the money, which in tax accounting terms means you didn't receive the cash, and you don't pay taxes on the distribution. Once your rollover distribution check arrives at your IRA custodian, you now have cash in your IRA that needs to be invested. You have two basic choices: 1) Invest it all at once or 2) Invest it in increments over some period of time. If you want to invest it all at once, you want to be careful to diversify (spread risk over several different investments) and build a portfolio of mutual funds. If you want to reduce market risk, you can dollar-cost average into your chosen mutual funds by investing a set amount of dollars per month over a certain period of time, such as 12 months. This way, if the market fluctuates significantly, you will buy some shares at higher prices and some shares at lower prices. DCA especially works best when prices are high and expected to fall. However, it is not wise for most investors to attempt market timing. How Much Risk Should You Take with Your Investments?